A Baby’s Bones was a book that took me by surprise and out of my normal comfort zone. It is true, that I have been reading more and more crime and thriller books. 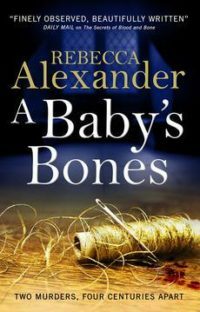 However, A Baby’s Bones is the first real mystery that I have read in a long time. As the book cover suggests, the book has two murder mysteries set in two different time periods. However, much of the book is centred around the remains of a new born baby and a woman found in the well. Part of the book is set in the present, with Archeologist Sage Westfield and two students that are helping her, trying to identify the remains and the circumstances surrounding their final resting place. This is broken up with excerpts from a steward from Tudor times. It was interesting to read, at least from this stewards point of view, a time where religious persecution and jealousy could lead to being accused of witchcraft and ultimately a horrible death. The parts that were reciting past events slowly began to reveal who it was that ended up in the well. There were a number of misdirects, especially when Sage’s research seemed to contradict what we had learned from the steward. The conclusion of this plotline was very harrowing and I couldn’t help but feel for those that were involved. The really interesting thing was the events that were happening in the present. Sage was not the typical female character in these types of books. At the beginning, you find out that she is pregnant and she has split up with the father of the baby. As fate would have it, Sage finds a growing attraction to the local vicar, which was such a sweet thing to witness. Reading the flirtations between the two, was so sweet and I couldn’t help but hope that more would come of this. I was so swept up with the mysteries from the past and the attraction between Sage and the Vicar, that it never occurred to me that I had read almost two thirds of the book and yet there was still no sign of the murder in the present. So, when the identity of the victim did reveal itself, it was shocking and I began to try to figure out who could be the perpetrator. I did feel that there was some sort of link to Sage because it seemed that those people who she became close to, began to get harassed. This was very apparent with the vicar who was getting threatening phone calls at the beginning of their friendship. This lead me to suspect Sage’s ex, even though it was clear that they were over. After finishing this book, I found myself wanting to find out more about Sage, especially how she will juggle being a mother with her career. The subject of this type of Archaeology is really interesting and it was very impressive how the author managed to draw parallels with the past and present. A Baby’s Bones has stretched my reading and I wouldn’t hesitate in picking up another book by this author. She has created a character that is instantly likeable and very relatable. Couple with this mystery originating in the past and you have a really great read. This is a book I would highly recommend in picking up.